Daily Illuminator: Upgraded Templates For Transhuman Space? How Bazaar! February 1, 2015: Upgraded Templates For Transhuman Space? How Bazaar! Transhuman Space: Changing Times brought the fantastic world of Transhuman Space to GURPS Fourth Edition, with rules, guidelines, and setting insight. The upgrade mission continued with Transhuman Space: Shell-Tech, with Fourth Edition info for cybershells and bioshells. 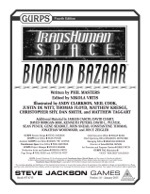 Now, Transhuman Space: Bioroid Bazaar performs the same upgrade on the biotechnological side of Transhuman Space, with updated templates for human upgrades, parahumans, bioroids, and uplifted animals. Written by Transhuman Space Line Editor Phil Masters, this supplement also provides a few new designs, including the disturbing Leonardo bioroid, the tragic J7-S53 "upgrade," and others. Finally, it offers intel on advantages and disadvantages, quirks and perks, and more of interest to biotechnologists. In the future, updating your body is easier than ever . . . just like updating your Transhuman Space campaign has never been simpler, thanks to a visit to the Bioroid Bazaar. Download your copy today, from Warehouse 23!